We analyze and intercompare the performance of a set of ten regional climate models (RCMs) along with the ensemble mean of their statistics in simulating daily precipitation characteristics during the West African monsoon (WAM) period (June–July–August–September). The experiments are conducted within the framework of the COordinated Regional Downscaling Experiments for the African domain. We find that the RCMs exhibit substantial differences that are associated with a wide range of estimates of higher-order statistics, such as intensity, frequency, and daily extremes mostly driven by the convective scheme employed. For instance, a number of the RCMs simulate a similar number of wet days compared to observations but greater rainfall intensity, especially in oceanic regions adjacent to the Guinea Highlands because of a larger number of heavy precipitation events. Other models exhibit a higher wet-day frequency but much lower rainfall intensity over West Africa due to the occurrence of less frequent heavy rainfall events. This indicates the existence of large uncertainties related to the simulation of daily rainfall characteristics by the RCMs. The ensemble mean of the indices substantially improves the RCMs’ simulated frequency and intensity of precipitation events, moderately outperforms that of the 95th percentile, and provides mixed benefits for the dry and wet spells. Although the ensemble mean improved results cannot be generalized, such an approach produces encouraging results and can help, to some extent, to improve the robustness of the response of the WAM daily precipitation to the anthropogenic greenhouse gas warming. The online version of this article (doi: 10.1007/s00704-014-1352-3) contains supplementary material, which is available to authorized users. This paper is a contribution of the West African Analysis group to the CORDEX program. Therefore, we would like to gratefully thank WCRP and START for setting up and funding the CORDEX-Africa analysis initiative and the University of Cape Town for leading the training and analysis program. We would also like to thank the regional downscaling groups who kindly shared the downscaled data used in this analysis. Many thanks to the reviewers whose comments substantially improve the quality of this manuscript. Dee and co-authors (2011): The ERA-Interim reanalysis: configuration and performance of the data assimilation system. Quarterly Journal of the Royal Meteorology Society 137: 553-597. doi: 10.1002/qj.828. 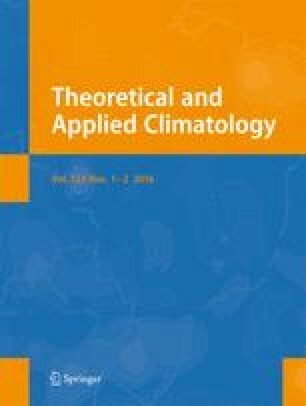 Sylla MB, Gaye AT, Jenkins GS (2012) On the fine-scale topography regulating changes in atmospheric hydrological cycle and extreme rainfall over West Africa in a regional climate model projections. International Journal of Geophysics 2012, Article ID 981649, doi: 10.1155/2012/981649.